Are you trusting God and living by faith? Learn how with Dr. David Reagan on the show Christ in Prophecy. Last Aired on April 12, 2015. 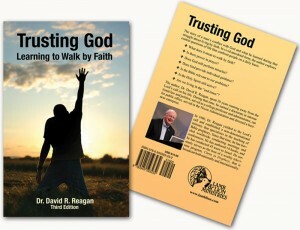 Dr. Reagan: Have you ever lived by faith? Well, I have. I’ve been doing it for the past 35 years and it can be a terrifying experience, but it can also be the most invigorating and thrilling experience that you can ever have. The best part of it is that it will lead you into a deeper relationship with the Lord than you ever thought possible. For some insights about living by faith, stay tuned. I established this ministry in 1980, having spent 20 years as a professor and administrator in higher education. During those years I was an active student of the Bible, and I often taught and even preached. And although I was very successful in my academic career, I was miserable because I was running from the Lord. You see, the Lord graciously called me into the ministry when I was 20 years old, but I was too caught up with trying to achieve worldly success to respond positively to the Lord’s call. So, I started running from the Lord, and in the process, I made Jonah look like an amateur! The Lord finally got my undivided attention through a business failure. I want to share that story with you, and to do so, I want to share with you a presentation I made about a year ago at my home church, the Brookhaven Church in McKinney, Texas, a suburb of Dallas. Dr. Reagan: I represent a ministry called Lamb & Lion Ministries and it is a Bible prophecy ministry. From the very beginning until this day we’ve had one goal and one goal only and that is to proclaim the soon coming of Jesus to as many people as we can, as quickly as we can; and we do that in a great variety of ways. And the message is like a two edge sword; for the believer the message is commit your life to holiness, commit your life to evangelism. And to the unbeliever the message is flee from the wrath that is to come by fleeing into the loving arms of Jesus right now. We founded the ministry in 1980 and even though our focus was Bible prophecy and still is, and although I have written many books on Bible prophecy the very first book I ever wrote had nothing to do with Bible prophecy. It had to do with faith. The title of the book was “Trusting God: Learning to Live by Faith.” And the reason that was my very first book written in 1987 is because the first seven years of the ministry as I was teaching Bible prophecy God was teaching me a whole lot of lessons about myself and about Him. And He was teaching me about how to live by faith. I was born into a Christian family. I was raised in the church. And when I say that I really mean it. I was thinking about that on the way here this morning what a radically different world we live in today than the one I was raised in. I was raised in the church. I was there every time the door was open; we were there on Sunday morning, Sunday night, Wednesday night, Vacation Bible School, Gospel meeting after Gospel meeting I mean I was just a church kid. We didn’t have the diversions that we have today. We had no television. Yes, I was before television. We had no television. Everything was closed on Sunday, everything, there was nothing open. There were no sports events on Sundays. We could focus on the Lord, we could focus on His Word, we could focus on church. How that’s changed. So I grew up in the church and during that time I learned a lot of things about the Lord but I never did come to really know the Lord, there is a big difference in knowing about somebody and really knowing them. By the time I was 12 years old I was a walking encyclopedia of the Bible I could quote the books, I could quote verses, all kinds of things. But I was also as I grew up became a teacher and I even became a preacher even though I was not full-time I was in other careers but I was teaching all the time, preaching all the time. And I taught a lot about faith, and I preached a lot about faith, but you know what I found out? It is a big difference to talk about it and do it. And in 1980 when I stepped out in faith I discovered I didn’t know the first thing about living by faith, and I found out that it was a very scary thing. And over the years I found out it was the most wonderful thing that I ever did in my life as I learned more about God and what it means to walk by faith. And I want to share some of those lessons with you this morning. But first of all let me just give you a little background about myself. I grew up in Waco, Texas. And I went to the University of Texas in Austin, I entered there in 1956 and I graduated in ’59 in Government and History. I had gone through in three years’ time, winter, and summer year round and I was burned out, I was just fed up with school. So instead of going on to law school or graduate school I didn’t know which one I wanted to go to. I decided I was just going to rest for a year, so I laid out for a year thinking that I was going to rest. I really did rest but I had a whole different type of thing to do. I worked for my dad in his construction company and then within weeks after I graduated from the university through a very bizarre series of circumstances I became the pastor of a little country church in Grosebeck, Texas. It was a weekend deal for me, and it was a baptism of fire. There were only two families in the church. One family sat on this side, one family sat on that side; they hated each other with a passion and would not speak to each other. It was really a wonderful experience. Nobody knew how to do anything. So I had to lead the prayers. I had to lead the singing. I preached. I did the youth ministry. I served the communion. I did everything. My wife, well she wasn’t my wife at the time she was my girlfriend Ann would go with me every Sunday and help me do all those things. So it was quite an interesting experience. And you know what I knew the moment that God worked through those bizarre circumstances to put me in that positon, I knew that He had called me into the ministry. But unlike Isaiah who said, “Here I am Lord, send me.” I said, “Here I am Lord send anybody in the world, but me. I am not interested.” And I began to run from the Lord. I had big ideas I was going to become a–I was going to go to law school and I was going to become a big politician and I was going to be a politician for the Lord. That is the way I justified it. I was just running from the Lord as far as I could run. And I really did intend to go to law school but that year something happened. I got a letter in the mail and a professor of mine had nominated me for a Woodrow Wilson Fellowship. And I didn’t know what that was and I went to Austin, Texas I was interviewed and I was given the fellowship and it entitled me to go to any school in the United States free of charge. So, I went up to Boston to Harvard University and I earned some degrees there, and my doctorate in International Law and Politics and I began a career in academics and I taught for 20 years at the university level teaching International Law and Politics all the time running from the Lord. And you know what I found out something very interesting you can accomplish a lot in life, you accomplish all kinds of accolades and awards and all that sort of thing, but if you’re not in the center of God’s will you will be miserable it doesn’t matter what you achieved. No matter how much money you’ve earned, how many awards you get if you are not in the center of God’s will you are going to be miserable; and I was miserable. I was just absolutely miserable. And I had my Heavenly Father on my back, calling me into the ministry. Finally I got so miserable after 20 years that one day I decided that I was going to take a very radical step and give up my academic career and I was going to do something that would get both fathers off my back at the same time. I thought it was pure genius what I came up with. I decided what I would do is I would sell everything I had and take that money and I would open up a Christian store here in the Dallas area; in fact it was downtown Dallas. And it would have everything it would have books, and music, it would have choir robes, and communion supplies and everything, it was going to be the largest Christian store in Dallas; I called it Renewal House. And that way I would get my earthly father off my back because I would be in business. And I would get my Heavenly Father off my back because I was going to meet Him half-way. I had a few things to learn. So, I sold everything. I invested in this business. I spent probably a year getting ready to open the business and finally got it open. I operated it for about a year and a half, and although it grew every month that I operated it, nonetheless it didn’t grow fast enough and at the end of a year and a half, I had no money left. I went down to the bank to borrow some more money and when I walked in I will never forget the surprise, I looked around and I didn’t recognize a single face in the bank. The bank had been sold and they had cleaned house and all new people were there and I didn’t know any of them. And I went to the person they said was my loan office and I told him I needed some more money, and he said, “Son, you’re not getting any more money, that’s it.” I said, “I’m going to go broke. I will lose my business.” He said, “Well you just have to lose it because you are not getting any more money.” I said, “How much do I owe you?” He said, “You owe me a $100,000.” I couldn’t even imagine $100,000. Last night I got on the computer and I went to that place on the computer that is called the inflation index where it calculates what money in a certain year is worth today, that was 1977 or ’78 and $100,000 then is $350,000 today. That is what I owed the bank. I didn’t know what I was going to do. I went into depression. I threw a pity party. I felt sorry for myself. I just couldn’t think I was so depressed I didn’t know what to do. I didn’t know how to turn to the Lord. You see here is the interesting thing even though I had grown up in the church, and even though I had been immersed in the Bible again I knew all about that but I didn’t know God. You know it’s a difference in knowing about somebody, and knowing them. I know about Billy Graham, I’ve read every book he’s written. I have read biographies of him. But I do not know Billy Graham I’ve never sat down, I’ve never looked into his eyes, I’ve never talked to him, I’ve never asked him what type of food he likes, or what type of food he doesn’t like. I don’t know him. I knew about God, but I didn’t know God. I didn’t know how to reach out to God. And further more I didn’t believe that if I did God would do anything anyway. You’ve got to understand the kind of church I grew up in. I’ll tell you a little bit more about that in a moment. But I was desperate, reaching around trying to you know please God, you know do something and I just didn’t know what to do. And in the midst of all this desperation I finally got to the point where I became suicidal and I was constantly thinking of suicide. And it was right in the middle of all that that suddenly a voice spoke to me in my spirit. And today I know it was the Holy Spirit because you see when I was 12 years old I accepted Jesus Christ as my Lord and Savior and the Holy Spirit had moved in and take residence but He wasn’t president; He wasn’t in charge of my life. But He spoke to me and the message was very simple, over and over and over try God, try God, try God. I kept wondering what that meant and I finally decided well I think I’ll do this. So I called about five members of my congregation and I said to them, “Why don’t you come over to my house?” And these were five men and they came over and we sat around the kitchen table and I told them how desperate I was and I said, “I need a miracle. I need a miracle.” And I said, “Would you pray for me?” And we started around the table and they started praying one by one. I never heard such lifeless prayers in all my life, they were not even reaching the ceiling. Now, Lord we’re concerned about David and you know if you can do anything for him, well we would appreciate if you would do something. And finally I just took my fist and banged on the table and I said, “Stop it.” I said, “There prayers are absolutely awful.” I said, “Why don’t you pray with some faith.” And they said, “Ok, well we’ll pretend we’ve got faith and we’ll just keep on going.” It was awful. But the very next morning God answered that prayer. The very next morning. And you would guess for a 1,000 years and you would never be able to guess how God answered that prayer because He did it in such a very, very strange manner. Let me just pause here for a moment before I tell you how He answered the prayer and give you a little bit more background about the church I grew up in. The church I grew up in was a church that was always into the Bible, mainly the New Testament we never talked about the Old Testament. And in the New Testament we never talked about the Holy Spirit that was a taboo topic. Our leaders felt that if you talked about the Holy Spirit somebody would get carried away and start babbling or do something weird so we didn’t talk about the Holy Spirit. And I had difficulty with the Holy Spirit because the only version of the Bible I had was a King James Version and it referred to the Holy Spirit as the Holy Ghost. And I couldn’t figure that out because I was a Boy Scout we would go out on Boy Scout campouts and we’d talk about the campfire and try to scare each other to death by telling ghost stories. And ghost were always bad, they were evil, how could the Holy Ghost be good? I couldn’t figure that out. I was 12 years at the time, you know it was very difficult for me to figure these things out. And then one Saturday morning I got on the bus in Waco, Texas it cost me a nickel, rode the bus downtown Waco, went to the Strand Theater it cost me nine cents. I went in and they showed a double feature, two cowboy movies and in the middle they always showed a cartoon and one of those things were the lady was always left on the railroad track and you had to come back next week to find out, you know one of these serials. Well I watched the cowboy movie, I watched the serial and then guess what the cartoon was? Casper the Friendly Ghost. Suddenly all my theology came together, the Holy Ghost is like Casper the Friendly Ghost, he is always there to pick you up and dust you off, and help you and so forth. And I just didn’t have any problem with Holy Ghost until I was 16. And then at 16 we had a rite of passage in our church it was called Young Men’s Bible Training Class, all 16 year olds were required to go; where you learned how to pray, learned how to pass communion, learned how to study the Bible and all that sort of thing and learn the fundamental doctrines of the Church. And the night we got to the Holy Ghost the man who was teaching said, “Does anybody here know, could explain to me the Holy Ghost?” I raised my hand and said, “Yes, sir, He is like Casper the Friendly Ghost.” And brother, whoa, he cut me off at the knees, I mean that was the silliest thing he had ever heard of, it was absolute nonsense. He said, “Son, let me tell you what the Holy Ghost is, the Holy Ghost is the Bible. And the more Bible you learn the more Holy Ghost you get. But there is no such thing as a person called the Holy Spirit.” So I had the Holy Spirit residing in me, but I didn’t know that He was there, and I didn’t know much about Him. But that is the kind of environment that I grew up in. Let me tell you something else about our environment; our church believed in cessationism. Cessationism, that’s the idea that when the last Apostle died all the supernatural ended, that is what we were taught. When the last Apostle died all the supernatural ended; the gifts of the Spirit ended, the works of the Holy Spirit ended, God went into retirement, there was no such thing as miracles anymore, that all of that ended in the First Century. And the idea of praying for somebody’s healing was just considered bizarre. I mean if our preacher ever prayed for somebody to be healed he would say, “Lord, in the name of Jesus would you please help the doctors remember what they learned in medical school and help them to write the right prescription and so forth.” But if he had said, “Lord we are concerned about sister so and so, in the name of Jesus would you please heal her.” We would have had five coronaries in the audience right there because he mentioned the word heal. Because we didn’t believe in healing; all of that ended in the First Century. We were also a very, very legalistic church, very legalistic. I mean the essence of Christianity was the do’s and the don’ts we had the list of do’s and the list of don’ts and the things that you had to memorize and all of that. And there was never any talk about a personal relationship with the Lord. And then he said, “Many, many years later I came home one day with terror in my eyes, because I was an interpreter at the America Embassy. And they had called me in and told me that they were going to flee from that nation that I could go but none of my family. And I told them, ‘I would not leave my family.’ So I did the same thing my father did. I told the family to get in a circle and for the second time I ran through the house. I got all the things. I threw them in the middle we tied all the sacks. And we fled in the jungle not knowing how to live in the jungle even.” He said, “We wandered for days, and days, and finally through the Mekong Delta we got to a cost line and there was a refugee ship. God had saved us for the second time. We got on the refugee ship.” And he said, “They pulled out of the South China Sea and the ship started sinking there were so many people on it, thousands and thousands and they started fighting each other, and pushing each other overboard.” He said, “We just got over to a quiet place that we could find and we got on our knees and prayed, ‘God save us. God help us.” And he said, “God did it.” He said, “An American destroyer pulled up and off loaded us. And God had saved us for a third time. And that destroyer took us to the Philippines. And said, “They put us in like a concentration camp in the Philippines and we were there for over two years and every day we prayed, ‘God help us. God save us. God deliver us from this.’ And one day the news came that a Bible church in Dallas, Texas had adopted our family. So here we are now in the United States of America starting our lives all over again.” He hugged me, and I hugged him and he left. And everything had changed. And yet nothing had changed. I still owed the bank $100,000. I still had a failed business. But everything had changed because that man through his testimony got my eyes off myself, and got them on God. And I realized that I didn’t have any problems, any compared to what he had had over, and over, and over. And yet God had delivered him from each one of those as he and his family had prayed so earnestly. And so I began to pray to God. And I began to focus upon God and not on myself. The pity party was over. There were some hard years ahead because what I did was to negotiate a settlement with the bank. I still owed them after I sold everything off; I still owed them over $60,000. And I negotiated a settlement, I had to pay them $1,000 a month for 7 years. We had to cut our lifestyle more than in half. We moved into a tiny duplex. We had an old broken down car that we were driving. We lived off my wife’s income as a first grade teacher, while I worked to pay off that debt. And that was even good because the Lord delivered us from the American lifestyle of materialism; of no matter how much you have you’ve got to have more, no matter how many cars you’ve got to have more, no matter how big a house you’ve got to have a bigger one. And we learned that we could live very simply and be very, very happy. It wasn’t easy but we did it. Dr. Reagan: Welcome back to Christ in Prophecy. I hope you have been blessed by what I have shared in that sermon. So, to make a long story short, God used a business failure to get my attention. And in the process He convinced me that He is alive and well, that He is still on the throne, that He hears prayers and He still answers prayers, He also still performs miracles. But, I still had a long way to go to get from a business failure to full-time ministry, and that process was one in which I continued to experience the miracle working power of God. Next week, the Lord willing, we will continue with this story, and I will share with you the incredible chain of events that God used to get me to establish this ministry in 1980. And I will also share some of the things I learned about God and walking by faith as I interacted with Him.